In 1910, a traveling American businessman discovered Scouting and brought it home to America. And that same year, a Hawaii artist and outdoorsman by the name of Hitchcock discovered Scouting in California, and brought it home to Hawaii. Yes, Scouting in the islands has been around a long time – and from the very beginning, it had a dramatic mission. To not only Be Prepared – but to do a good turn every day. To be trustworthy, loyal, helpful, friendly, courteous, kind, obedient, cheerful, thrifty, brave, clean and reverent – as well as to do one’s duty to God and country. This year, Aloha Council launched the "Get Grit" theme. This is what the Scouting program teaches is for Scouts to never give up, keep trying and do your best! Quite a commitment in 1910 – and equally important today. 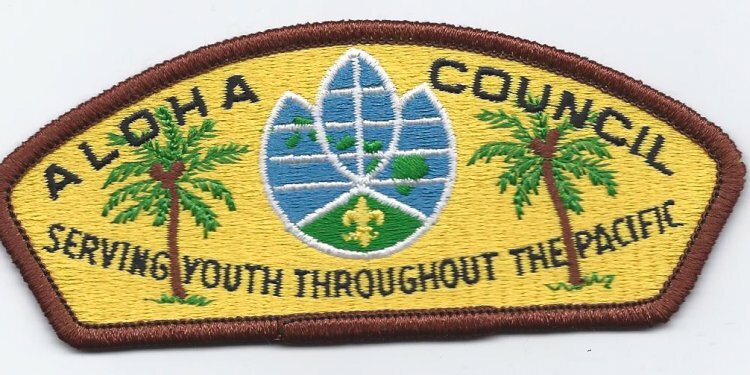 Within months of returning home, Mr. Hitchcock set up Hawaii’s first local troop – Scout Troop 1, the famed Rainbow Patrol sponsored by Punahou School and still in existence today. Local community leaders quickly became involved in giving Scouting life in Hawaii. Because of this early community support Scouting was quickly organized and grew. And because of those early community leaders Scouting established a deeply rooted heritage in Hawaii that is beyond comparison. Many things have changed over the decades in Hawaii – but Scouting and its mission remain constant and continue to flourish. Today more than 12, 000 young men AND women regularly engage with nearly 5, 000 volunteers in Scouting activities. The Aloha Council is flourishing geographically as well – encompassing not only Hawaii, but Guam, American Samoa, Marianas, Marshall Islands, Micronesia and Palau. In all – the Aloha Council covers the largest geographical area in the world – over 8, 000, 000 square miles on both sides of the equator and date line! In Scouting, it’s never too young to begin learning to do things on your own, setting goals, sharing with others and enjoying the rewards of achievement. As youth grow in the program our outcomes show that the character traits, leadership skills and citizenship attributes that all parents want for their children become a reality. We see what Scouting does for tomorrow’s leaders – but how about today’s leaders? How about the thousands of adults who give of their time, talents, energy and love to make Scouting work? What’s in it for them? Plenty! Because every time a child learns to create something – to share a goal – to learn a lesson – to achieve and grow – you as an adult learn, grow and achieve as well. And how important are those lessons and those skills to a parent, an employee or employer, or to the growth and success of our community? It takes adult leadership to make Scouting successful. But not everyone is a born leader. And to that end, Scouting is constantly equipping adult volunteers to do a better job of leading. Regular and customized training sessions are held to help Scout leaders be successful in their volunteerism at every level of participation. Of course we need adults who are comfortable working with kids – theirs and others. Who love to watch them grow and connect with good character, life skills and fun! But not everyone need work with youth to make an impact. Scouting grows because of great people in all areas of leadership. Small group projects and initiatives, fundraising, program support, membership and adult leader recruitment. These are just a few areas where your existing skills can be helpful. In addition you will be involved in acquiring new leadership skills that will profoundly impact your life. The great thing about Scouting in Hawaii is there’s always something going on, and always a way for everyone to contribute. And we can tailor times and activities to suit your interests and availability. The Aloha Council and Scouting in Hawaii – and our developing programs throughout the remote areas of the Pacific – continues to grow. And we need YOU to help make that growth successful and to continue. Perhaps the most unique aspect of Scouting is that – unlike many other activities –it doesn’t focus on competition – it focuses on achievement. Something everyone experiences in Scouting and strives for in their day to day lives. But we can only continue our growth and strong heritage with your help. Become a part of a volunteer movement that has served local families for over 90 years. We are changing lives of youth, leaders and families. Become a partner with Scouting and watch our communities next generation of leaders grow and achieve!